Pruning keeps fruit trees healthy, encourages stronger limbs and new growth, prevents trees from becoming too tall and eliminates diseased or dying branches. You can prune apple trees at almost any time of year, but Oregon State University recommends you prune trees in late winter, before new growth in the spring. 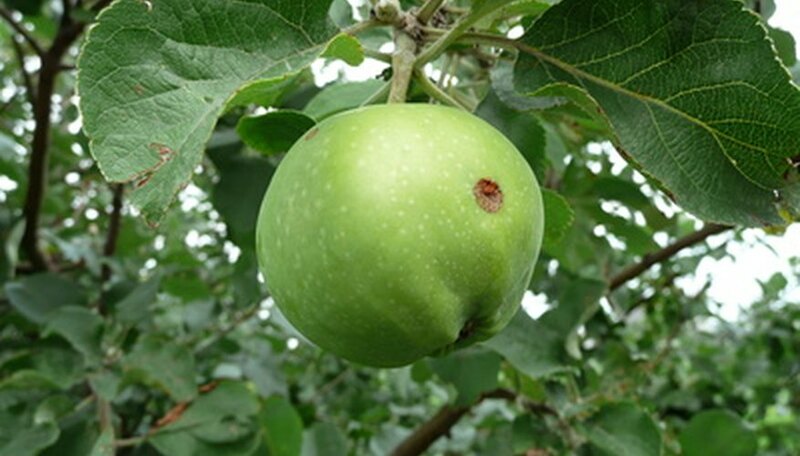 Most modern varieties of apples produce fruit on spurs, or small side branches, and are known as spur-bearing apples. But some older varieties, such as Gravenstein, Winesap, Pippin and Macintosh, produce fruit at the ends of branches; these are known as tip-bearing apples. Stand 10 feet away from the tree and study its form. Identify the largest central branches. Most apple trees are pruned using the central leader method, with a main central trunk and several branches spreading horizontally from this trunk. Position your ladder beside the tree trunk. Carry your pruning saw up the ladder and stand on the second from last or next to last step—wherever you feel most comfortable. Imagine you're picking apples. How far could you reach? Cut back the central branch to this height. Make a clean cut, straight across with the pruning saw. Cut off any branches or limbs that grow straight up or straight down. The straight up branches are known as water sprouts and rarely bear fruit. Use the pruning saw to remove larger branches and limbs and the loppers to cut off thinner limbs and twigs. Remove any branches that cross other branches. Your goal is to open up the interior of the tree so that light and air reach more of the main limbs. Remove older branches that have become less productive. As you cut older branches, identify newer branches you want to take their place. Prune the top of the tree every four to five years to keep the tree at a manageable height for picking apples. You will lose some production from that part of the tree in the years you prune, but new growth in subsequent years will make up for the loss. Trim away non-productive branches in summer, when it's easier to recognize which branches aren't producing fruit. Have someone hold the ladder for you to make sure it's steady. It isn't necessary to paint your pruning cuts with anything. A healthy tree will soon heal itself. Use an extension for your pruning saw, or one you can operate from the ground if you cannot easily reach a branch with a hand saw. Avoid cutting off the ends of your main branches and limbs, as this is where new fruit develops on tip-bearing trees. Only trim the ends of branches if the wood is damaged. Never stand on the top step of the ladder.